Donald Takayama's personally shaped, signed DOUBLE ENDER. Entirely hand shaped and finished by Donald. 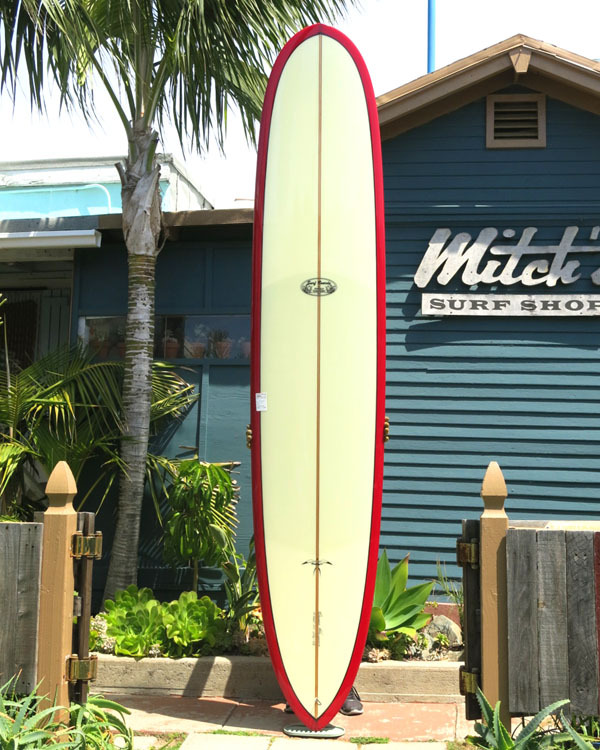 Ultra-classic 10' retro shape with Volan glassing, a clear deck inlay and deep cranberry red tint body. Gloss & polish finish with black low-profile logos, full body black pinlines on deck. Volan glassing top and bottom, forward swept fin patch and knee patch all of 8 oz. Volan. Takayama signature t-band stringer of double 1/8" cedars outside a 1/8" basswood core. Rounded pulled-in tail, single center fin box, Takayama center fin included. Mint condition; never surfed, never used; as of 2018 this has been in climate-controlled storage, untouched for 7 years. Length: 10' Width: 23 1/4" Thick: 3 1/8"
Nose: 19" Tail: 15 1/4"
The Double Ender has both the nose and tail pulled in for speedy overhead sections. Good in any size waves, its full potential shines in overhead waves. Hand shaped and glassed polyurethane foam by Donald Takayama.